Katsu Dojo is a traditional martial arts school for students of all ages and ability levels. We have programs for recreational students all the way to International athletic competitors. Our athletes have won over 100 National Championship gold medals since 1999. Our school is a member of USA Karate under the US Olympic Committee. Katsu Dojo instructors teach a traditional style of karate called Shito-Ryu. In addition to our regular karate classes, Katsu Dojo also offers Okinawan Kobudo (weapons), Tournament Classes, and Pre-Karate for our four and five year olds. We have four locations in North Florida including three in Gainesville and one in Jacksonville. Shito-ryu was founded by Kenwa Mabuni in 1928. It was directly influenced by both Naha-Te and Shuri-Te. Shito-ryu is fast, powerful and artistic. It incorporates the powerful Shuri-Te katas like Naifanchin and Bassai, the hard and soft Naha-Te katas like Sanchin and Kururunfa, and the artistic Chinese white crane katas like Niipaipo and Paipuren. In all, Shito Ryu includes over 50 katas. 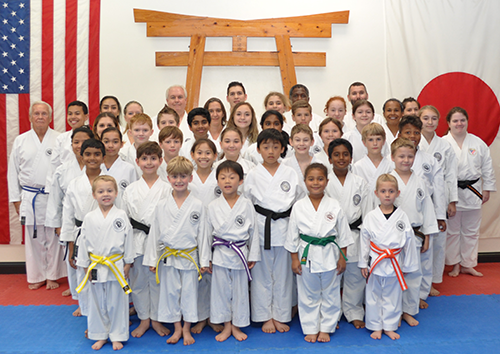 Katsu Dojo competes on the USA Karate tournament circuit. The US Olympic Committee recognizes USA Karate as the governing body for sport karate in the United States. Team Katsu members have over 100 National Chamionship gold medals since 1999. Please visit our Team katsu section to view tournament photos, videos, and our previous tournament results. Okinawan Kobudo is a Japanese term that is translated as "old martial way of Okinawa." 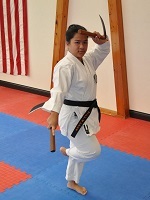 Students learn the basic principles of the Okinawan weapons that include the bo staff, sai, kama, and tonfa. Kobudo is a great way for students to improve their grip strength, better their hand-eye coordination, and gain a deeper knowledge of the Martial Arts. Katsu Dojo incorporates the basic skills of self defense on the ground. Students learn the principles of clinching, throwing and take downs, take down defense, positioning, pinning, controlling and subduing, submissions, escapes, counters and reversals. We teach a cohesive system designed to focus on the techniques required in a reality based confrontation. Pre-Karate is designed for children aged 4 and 5 years old. 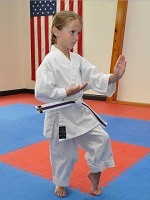 Children learn focus, self-control, and gain self-esteem while learning the basic principles of karate. In addition to learning skills like punching and kicking, children are also introduced to the Japanese language through counting, colors, and body parts. 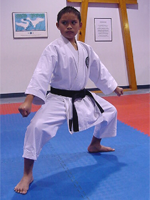 Pre-Karate has its own belt testing system and is available at all O2b Kids facilities. MD Tactics was created by Katsu Dojo to teach basic self-defense principles to psychiatric residents at the University of Florida. Health care workers suffer the highest rate of injury in the US workforce due to violence. MD Tactics is uniquely designed to teach healthcare professionals self-defense without harming a violent patient. Learn more about MD Tactics by clicking here. I was at Katsu Dojo throughout my four years as an undergrad in Gainesville and loved my experience there! The welcoming environment, the dedication of Jason and his team to all their students, and the expectation that you would put in the dedication to achieve your goals as well! This prepared me well for medical school and my career in pediatrics. Through dedicated practice, karate taught me self-discipline and warrior ethos. The lessons I learned from karate took time, but they developed me into the leader and athlete that I am today. As a cadet at the Air Force Academy, I feel karate prepared me for the many rigors I would have to face here: basic cadet training, jumping out of planes, the mindset of being a collegiate boxer, and the confidence needed to lead others. The one time an attempt was made at my life I was unarmed and caught off-guard, but when it happened, I was ready. Karate is more than just a hobby or a sport, it’s a lifestyle. Sensei Jason’s mentorship was exactly what I needed growing up. My daughter has been with Katsu Dojo for 10 years. She has loved the sport and has made great friends. She got me interested in starting karate as an adult. Katsu dojo has been a great part of our family. Whether you are looking for a great learning experience, a sport for all levels, or fitness, you can find it here with great people. Sensei Jason & Andrea are awesome, as are other instructors with Katsu Dojo! Yes they are not only very professional, serious & passionate about what they do but adored by & earn the respect from the children they teach. They are quite experienced as to knowing how to appropriately motivate and challenge the many different age groups, from preschool to adult ...we love how our boys "Musabi" to attention upon class start...& they are learning the many positive qualities that martial arts can offer. I'm excited about the new 39th Ave location, as this will provide our community at large, & all ages, even more martial arts opportunities! My older son has been with Katsu Dojo for 4 years. He loves going to Karate and was very excited when he was invited to join the team. Sensei Jason and the rest of the instructors do a great job of teaching and engaging the kids. The team has afforded my son who can be shy in large settings the opportunity to compete around the State of Florida. For a kid who does not like getting in front of a group of people it is amazing to me that he will step onto the mats and do his very best. He is well prepared by all those at Katsu Dojo. My son has also been focused on earning his black belt and is looking forward to accomplishing his goal as well as the responsibility that comes with it. I highly recommend Katsu Dojo. A few years ago, I decided to find a new hobby that will get me back in shape. So, since I have heard so many good things about karate, I joined Katsu Dojo. From the very first class I could tell that this was going to be an amazing experience, and it has been so far. All the instructors are very professional and experienced. As a matter of fact, many younger students compete successfully at national and international level. I started working out in my mid-thirties and, my physical ability and martial arts skills have improved significantly. I highly recommend Katsu Dojo Karate School because; it is such a great place to work out!!! You will get back in shape, learn to defend yourself, and have a lot of fun!!!! The entire staff is very knowledgeable and professional. All the challenges and belt tests that are sponsored by Katsu Dojo are very well organized. I have three children who take classes here with Sensei Jason Sorgi. I like that he encourages, motivates, and requires excellence from his students. They have learned focus, discipline, and self-control of their bodies and minds. My granddaughter Victoria and I joined the Katsu Dojo in January 2016 when I was 76. Victoria and I wanted to do something together and I especially wanted to improve my balance, flexibility and overall strength while Victoria wanted to learn the discipline. We have been attending classes together since then growing in the discipline and been very pleased with our instructors, facilities, training and progress. In October 2018, we are looking forward toward achieving black belt status and moving together to the next level. All credit to the expertise and training from the Katsu Dojo for our development. My daughters joined Katso Dojo more than 10 years ago - it has been a great opportunity for them to learn the sport of karate, compete in tournaments around the nation, make great friends, and learn the core principles of martial arts. In addition, it has helped shape their personalities into strong, confident young women. One morning before the school day started, my older daughter saw an upper classman bullying a younger student. She didn't know either student, but had the confidence to walk up to the older boy and tell him to stop - even when he moved to punch her, she didn't flinch. Being able to say STOP with confidence is an empowering skill. The strength, confidence, experience and discipline my daughter has learned at Katsu Dojo has allowed her to not only keep herself safe, but step up to help others when needed. The training my daughters received at Katsu Dojo has helped them gain courage and decision making skills that has already been of use in the hallways of their schools and as they walk down streets in foreign countries - but has also built confidence that helps whether they are taking a test, presenting a project in class, asking a teacher for help or confronting an unknown or dangerous situation. I highly recommend Katsu Dojo!